Back to Basics: How Is Glass Made? Glass is very ingrained in our society. We encounter it multiple times on a daily basis. When you drive to work, your glass windshield protects you from gravel, wind and insects. Once you arrive at work, odds are you walk into a large building that features many windows made of glass. Finally, at the end of the day, you travel to your house or your apartment. Whether you have a scenic view from your home, or the view of a brick wall, these views are seen through the glass lens of a window pane. 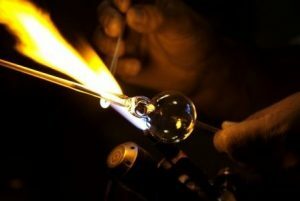 Glass is all around us, but we very rarely stop to think about the incredible process of how it is made. Glass is made when opaque sand is heated to extremely high temperatures, almost on par with what you might find inside of a volcano- more than 3,000 degrees Fahrenheit! When exposed to this incredible heat, sand becomes more liquid and exists in a gooey and malleable state. At this temperature, sand is not quite a solid and it is not quite a liquid, but it can be flattened, stretched, bent and molded to whatever shape it needs to be. As sand cools, it doesn’t turn back into dust and grains of sand. Instead, it becomes the glass we know so well, shaped into something that is considered an “amorphous solid” – not quite liquid, not quite solid, notes Explain that Stuff. This is the process that goes into making your windshield, the windows in your office building and home, the glasses on your face and so much more. At Affordable Glass & Mirror Co., we know glass incredibly well. We carry a wide variety of products, from windows and patterned glass to table tops and mirrors, just to name a few. As you know, one of the many purposes of glass is protects us, but it can be very fragile. That’s why we also offer repair services for any broken glass products. Whatever kind of glass you’re looking for or no matter your repair needs, Affordable Glass & Mirror Co. can help. Learn more by calling us today at 404-361-5151.